Right after the Super Bowl, a time-honored tradition takes place all across America: Girl Scout Cookie Time! When the order forms come out, so do those little ladies in khaki (formerly blue, brown and green), pulling at your heart strings (and wallets) to get you to buy dozens and dozens of boxes. Are you looking to buy some cookies? The last day to buy them will be March 11. Stock up now! Click below to find a gaggle of girls near you that will be honored and proud to sell to you! 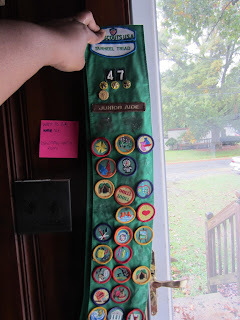 I have been a proud girl Scout since 1989. Most marriages don't last this long. My relationship with the Girl Scouts runs deep.While cleaning one day, I found my old Junior Girl Scout sash. A few badges are missing, but I am stoked I still have this! It's an antique! As you know, all Girl Scouts are creative, inventive, smart and active in their communities. One troop from my area created the video below to get you in the mood to buy cookies. These ladies have a future in the entertainment business... if not in front of the camera, definitely behind the scenes! Only TWO bakeries make all of those cookies?! Wow, that's really interesting. Do-Si-Dos are the absolute best, followed by Samosas, lemon creme and the shortbread. Delish!